Click on blog button above to see photographs and learn more about birds. "The New York Times," "The New Yorker," "New York Magazine," "WildBird Magazine," "The Daily News,"
"The New York Post," New York City Audubon and The New York Botanical Garden's "Science Blog." Becker leads bird walks for The New York Botanical Garden and teaches photography and creative writing classes. This website is an informative way to learn about the birds in and around NYC. "I became obsessed with bird watching many years ago and began studying birds and their behavior using photography, video and journal/blog writing." All the text and photographs on this site were written and photographed by Debbie Becker. No reproduction without permission. © Copyright 2012-2019, Debbie Becker. All rights reserved. Kirtland's Warbler, one of the rarest warblers you can find. This bird was found in Central Park on 5/11/18. When word got out birders showed up in the hundreds. Kirtland's Warblers live in a small habitat in Michigan. They don't live anywhere else. During migration, birds can lose their way due to storms, wind, or any other weather occurrence. One of the reasons Kirtland's warblers are so rare is due to the Cowbird laying its eggs in their nests. 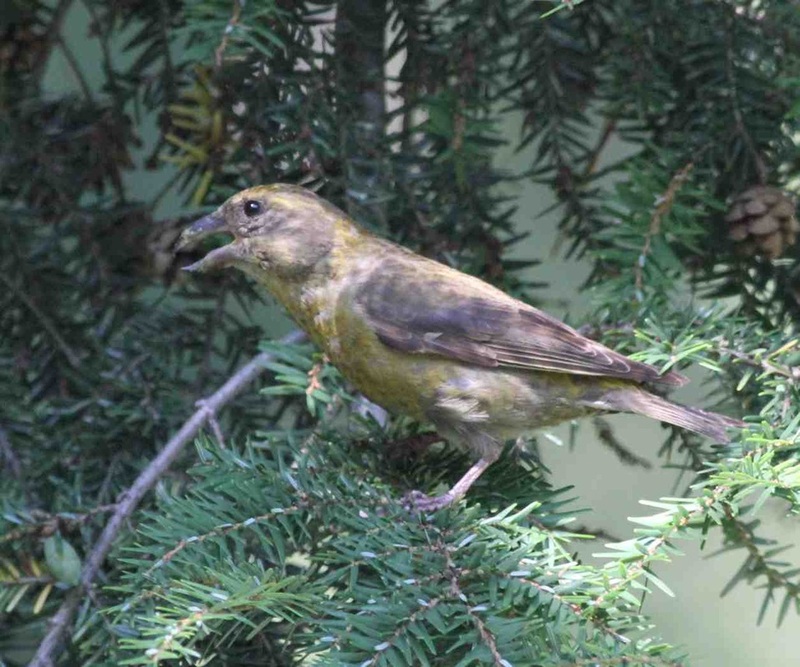 The warbler raises the Cowbird's chicks instead of its own. Seeing this bird was a thrill for me. It was the one warbler that I never imagined checking off on my life list. Eastern Blue Bird - Central Park 5/14 Additional pictures under "Seasonal Birds"
Birding during the month of March is always a challenge. Birds are coming and going and there is not much to see. 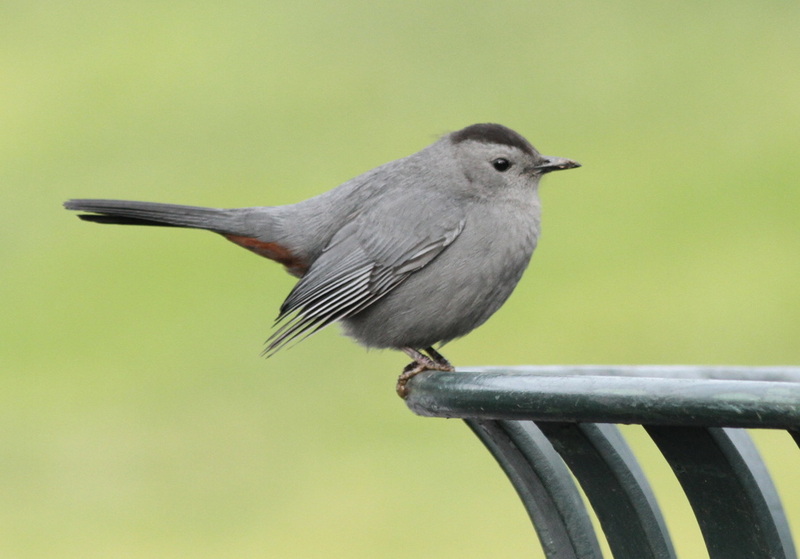 At NYBG we were able to find the usual winter birds and some of the rarer birds too. Rusty Blackbirds- Two in the Swale and two by Twin Lakes. As reported by Jack Rothman, large raft of Surf Scoter and 1 White-winged Scoter against the jetty at Orchard Beach. Bufflehead, Red breasted merganser and Scaup also in the Lagoon. Larger raft of Scaup in Eastchester Bay off City Island Bridge. Red throated loon off Cross Street and City Island Avenue. Also, Peregrine Falcon, immature Bald Eagle, Sharp-shinned hawk at the Lagoon. Rusty Blackbirds were observed by another birder. Anamazing number of Purple Finch continue to visit NYC. Today we saw 12 females and one male. Also spotted were Monk Parakeets, Palm Warbler, Pine Warbler, Common Yellowthroat, and a beautiful flock of Blue Birds! Birding for Evening Grosbeaks proved disappointing but we did find field and white crowned sparrows. A banner year for white crowned sparrows, both mature and immature. Lots of purple finch, too. Eastern Phoebe and Palm, Yellow Rumped and female black throated blues. The New York Botanical Garden was very birdy today. We hit two great spots near Azalea Way and the Native Plant Garden. A pair of ravens have taken up residency at NYBG and seem to be dominating the skies. Yesterday, we had a brief migration about 1:00pm after the winds switched. Four osprey and one Merlin. The osprey started to kettle looking for thermals and the ravens showed up and chased them off. Interesting behavior! Otherwise it was quiet with the usual, Catbird, cardinal, blue jays, mourning doves, red bellied woodpecker, chimney Swift’s, American Goldfinch, American Redstart and Common Yellowthroat. My regular free bird walks resume next Saturday morning at 11:00am. American Redstart -first fall Warbler for NYBG? Red tailed hawks - young fledglings calling for food by Twin Lakes. Great looks. Meadowhawks, Saddlebags, Blue dasher, Pondhawk, & Common Whitetail. The two newly fledged Red-Tailed hawks were squawking up a storm by Twin Lakes. At one point we saw white feathers floating through the air and discovered a fresh kill had been brought to one of the young hawks. The spring migration was slow to start, but once it got going it was simply fantastic. The constant rainy days in late May kept the warblers down and gave birders spectacular views of hard to see warblers such as Cape May, Blackburnian, Bay breasted and more. The last few days of migration in late May gave more birders - especially in Central Park- photo opportunities of their dreams! See "Warbler" tab above! June and July have brought Eastern Kingbirds, Baltimore Orioles, Warbling Vireos and Ruby-throated hummingbirds back to NYBG and Central Park. Two pair of Wood Thrush are also nesting at NYBG. Shore bird season is beginning in a few days and all eyes are on the broken water pipe at Orchard Beach. Unfortunately, the puddles at the Orchard Beach parking lot were paved over this past spring - dashing any hopes of seeing shore birds up close and personal. The broken pipe has created quite a pond in the grassy corner near the turn to beach. Let's hope the shore birds make an appearance. May 11, 2018 - Kirkland's Warbler!!!! 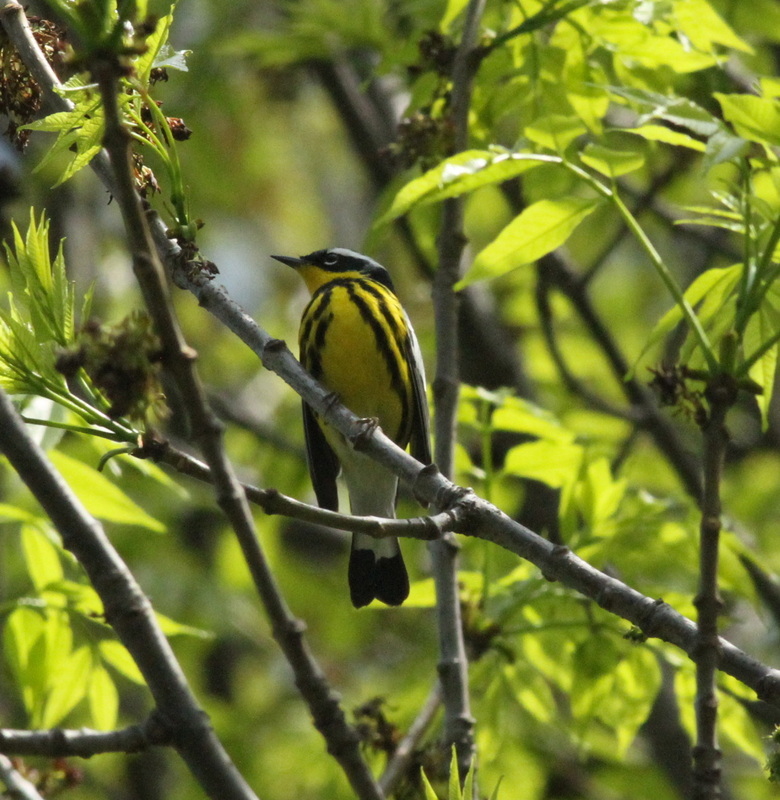 While it may not be "fallout" conditions, warblers and spring migrants have arrived in our city parks. The warblers are most active in the morning hours and then seem to disappear after noon. With winds from the south, conditions are ideal for migration. Summer Tanager, Seaside Sparrow, & Warblers. 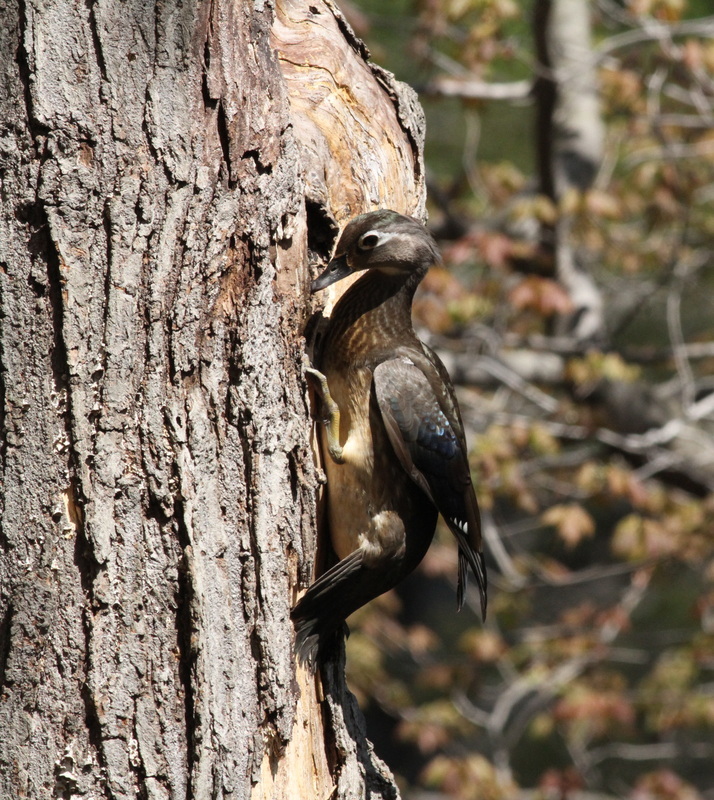 Pileated Woodpecker spotted & photographed in the southern section of the park near the statue. The highlights of my Saturday morning bird walk @NYBG were two ORANGE CROWNED WARBLERS at the base of Azalea Way and 16 RUSTY BLACKBIRDS in the swale. 9/21/17- Fall Migration is ON! Central Park - I birded the North Woods and Loch. Highlights include fleeting views of a much sort after Mourning Warbler. The warbler was located by the Pool in the northwest corner under a willow tree. I had some looks, enough to identify. Also spotted were Magnolia, Nashville, Bay-breasted, Parula, Cape May, Palm, Black throated blue, lots of American Redstarts, Common Yellowthroats and Black and white warblers. Scarlet tanager and male Rose breasted grosbeak added to the magic of the day. ​If you would like to see shore birds up close and personal - go to the Orchard Beach Parking Lot. Amazing shore birds have been gathering in a large rain puddle on the northeast end of the parking lot. Spotted so far: Semipalmated sandpiper and plovers, Least Sandpipers, Western Semipalmated Sandpipers, Pectoral Sandpipers, Short-billed Dowitchers, Lesser Yellowlegs, Baird's Sandpiper and today (8/30) Whimprels! Click on "Shorebirds" on the top tab to see more photos of these incredible birds. 8/12/17- Baird's Sandpiper at Orchard Beach! After my NYBG bird walk I drove over to Orchard Beach to see the shore birds in the puddles. The puddles were filled with semipalmated sandpipers! Among the sandpipers, three Pectoral Sandpipers stood out and then I caught a glimpse of a record bird for the Bronx- Baird's Sandpiper! My amazing sight was short lived as a car - out of nowhere - drove through the puddle sending all the birds flying towards the lagoon. Some of the birds rejoined in another puddle - but not the Baird's. Also observed semipalmated plovers, Forster's Tern, Common Tern, Osprey, herons and egrets. 7/22/17- Birds, Butterflies and Dragonflies! The green herons' offspring has fledged the nest and can be seen on the south side of the big lake hanging out with mom near the bushes. All the red tailed hawks are hunting on their own and have flown into the forest. Flickers, red bellied woodpeckers, yellow warbler, common yellowthroat, catbirds, bluejays, cardinals, tufted titmouse, wood thrush, white breasted nuthatch, mourning doves, Balt. Oriole, Eastern Kingbird, Warbling vireo, wood ducks, mallards, Eastern Wood Peewee and Eastern Phoebe were all nesting at NYBG. We have spotted silver spotted skipper, hairstreaks, summer azure, painted lady, red admiral, comma, tiger swallowtail and many dragonflies, including pond skimmers, saddle bags, cottontail, red damsels, and more. Rough winged swallows, tree swallows, great blue heron, great egret, great horned owls, mallards, chipping sparrows and song sparrows. Thanks to Linda we hit a nice pocket of warblers feeding in the black locust trees next to the Bronx River. We need to remember this location for next late May. Warblers were either dripping from the trees or scarce to find this past week. A very strange spring migration indeed. Red headed woodpecker - at the feeders- this is not the same bird that has been on 68th & 5th Ave.
4/29/17- NYBG -They're Here! The warblers and Spring Migrants Have Arrived! To see photos click on "Spring Migrants 2017" from the menu above. 4/1/17- Highlights of my bird tour @NYBG include Eastern Bluebird, Phoebes, Turkey Vulture, Sharp shinned hawk, Peregrine Falcon, Cooper's hawk, wood ducks, great horned owls and nesting red tailed hawks. 3/25/17- @NYBG - Eastern Phoebes! The Harbinger of Spring Arrives - spring is on its way! Golden Crowned Kinglets, Rusty Blackbird, YB Sapsucker, wood ducks, great blue heron and hooded merganser. Go Birding @NYBG, The New York Botanical Garden. Winter birding at its best! 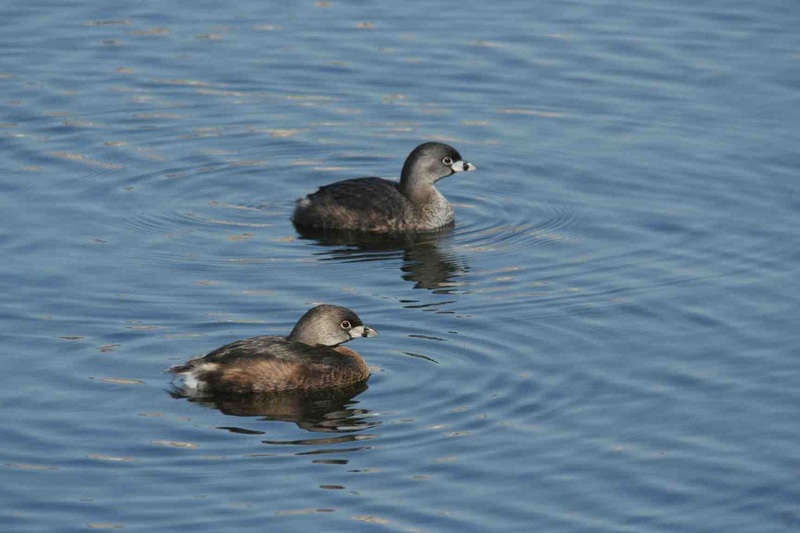 Birds of interest include: Rusty Black birds, Field Sparrows, Kinglets and American Woodcocks. 2/19/17- Canvasbacks have been reported at 147th and Hudson River. Highlights of today's bird walk include our nesting Great Horned Owls. The female seems to be attending to her nest as she was observed moving about and reaching low into the nest with her beak. The male is nearby, in a tree, guarding his family. Rusty blackbirds, red-winged blackbirds, yellow bellied sapsucker and a continuing Field Sparrow were some of the top birds we spotted. Our resident GHO are nesting and we are keeping our fingers crossed for owlets this year. For the last two years, the nest was not a success. If you should see nesting owls, at NYBG, or elsewhere, please KEEP your distance. Do not disturb them with noise, flash, or baiting. If you like to photograph wildlife then please respect the wildlife. At the NYBG on my Saturday morning bird walk. At the NYBG on my Saturday morning bird walk. 22 people. Despite the dreary day - we found some good birds to watch on my Saturday morning bird walk @ NYBG. Finally, a day with north west winds! 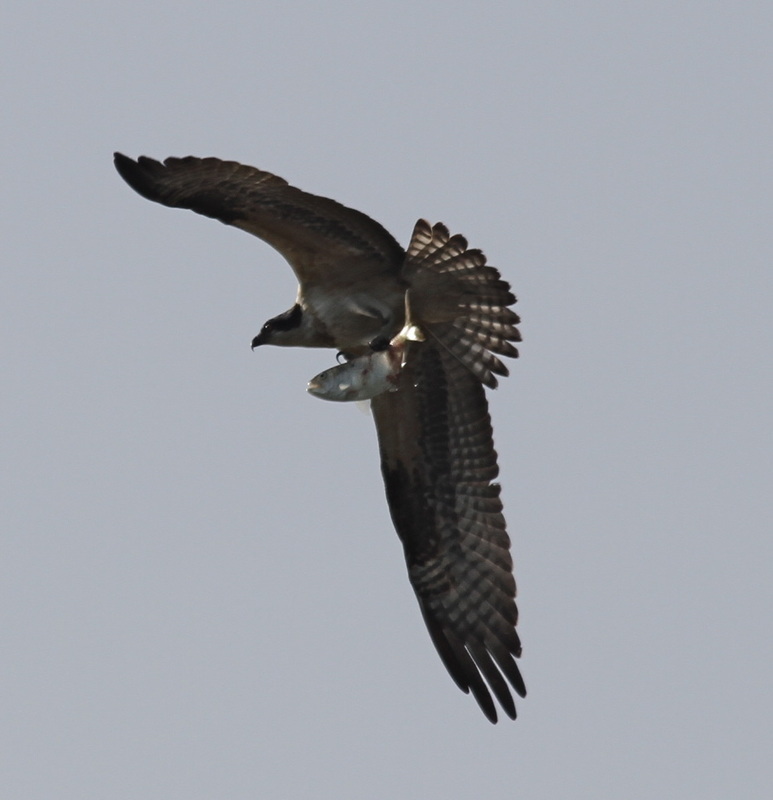 While it remained overcast we saw many low flying migratory hawks and osprey. We also had a nice pocket of warblers in the woods, in addition to a gray cheeked thrush. The first bird walk of the new season was simply fantastic! We had birds for three hours in most garden locations. Highlights include our first bird, a Great Horned Owl looking as majestic as ever sitting prominently out on a branch. We moved on to see a Solitary Sandpiper giving spectacular views at Twin Lakes. Also on the lakes were two Green Herons, an immature Night Heron and Belted Kingfisher. 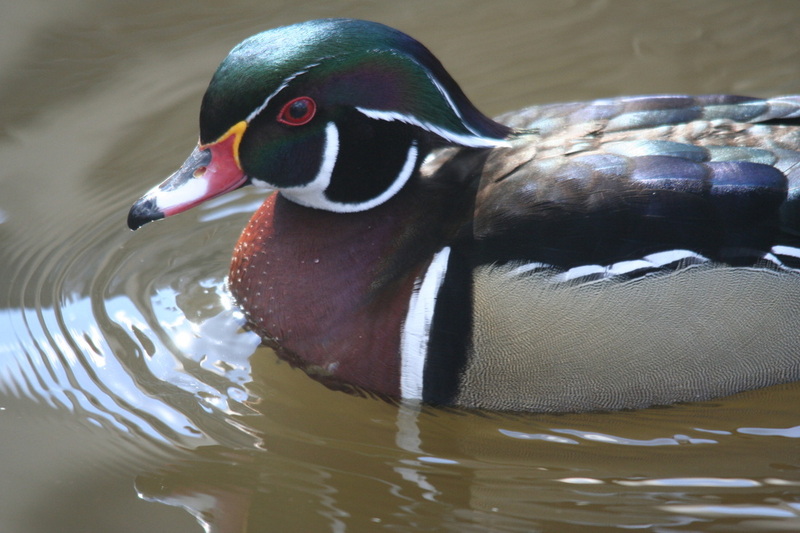 We viewed a family of wood ducks, mallards, Baltimore Orioles and a Ruby throated hummingbird's nest. We found a hummer later in the walk. We ran into a splendid pocket of warblers including black throated green, black and white, Northern Parula, Common Yellowthroat, American Redstart and two Red eyed vireos. ​Most birders, during the summer, become restless with free time between birding seasons. Many have comforted themselves by watching butterflies, dragonflies, moths and anything else that flies. It has been a long hot summer with not many birds to see. Shore birds were supposed to arrive the third week in July, but judging by some of the posts from Jamaica Bay, they are late or have diverted to another wetland area. Since Hurricane Sandy, the shorebird population, in the NYC area seems to have dwindled. ​Most of the nesting summer visitors have raised their young and have begun their migratory journey back to their winter habitats. As soon as September arrives we will see this migration begin and all the spring visitors will pass through again, but this time in drabber plumage. Look for Orioles, Tanagers, Hummingbirds, Grosbeaks, Warblers and of course, the highlight of the migration: Hawks and Eagles during the months of September and October. Yellow warbler, nesting Alder/Willow type flycatcher, great egrets, snowy egrets, great blue heron, osprey, red winged blackbirds, marsh wrens, barn swallows, Common Yellowthroats, Song Sparrows and flickers. Highlights of my free Saturday bird walk at NYBG include a MALE RUBY-THROATED HUMMINGBIRD. Even though it was an overcast day and the migration seems to be winding down we still had good looks at some pretty good birds on my Saturday morning bird walk @NYBG. Cedar waxwings were everywhere but most visible and posing for the camera while taking baths in the Native Plant Garden. Warbling vireos were definitely the voice of the day perched high in the trees warbling while the B. Orioles, in the same trees, were quiet and busy building nests. Eastern Kingbirds, perched high in treetops, were fly catching throughout the garden. Most the warblers we saw and heard were in the Native Plant Garden including the female Indigo bunting. A spectacular day of birding on my Saturday morning bird walk @NYBG. There were 57 birders ready to see warblers and the birds do not disappoint! We had wonderful eye level views of BAY BREASTED, BLACKPOLL and Black -throated Green off Hester Bridge. On the Ridge Trail we had great views of a male CAPE MAY and female BLACKBURNIAN -in one eyeglass - battling over inch worms. A female black-throated green and CANADA were also competing for insects in a nearby tree. A YELLOW warbler came in for a drink at the water basin inside the Native Plant Garden - the sun reflecting brightly off its yellow feathers - it really was a sight to behold. At the Swale we watched two Cedar Waxwings courting and also observed red tailed hawks circling, one with prey in its talons. It was a damp and dreary start to my Saturday morning bird walk at NYBG. Highlights of the walk included YELLOW WARBLERS, RED Tailed Hawks courting and Eastern Kingbirds. Yellow warblers were calling and Baltimore Orioles were busily feeding in the trees. A lone Nighthawk flew over Twin Lakes at 3:30pm. Highlights of my Saturday morning bird walk at NYBG include: an early VEERY, PINE WARBLERS, HERMIT THRUSH, TREE SWALLOWS and the spectacular sight of 5-6 GREAT BLUE HERONS, in breeding plumage, perched on the forest tree tops. We have run the gamut of -1 degree to 56 degrees in a matter of seven days. But how does it affect the birds? Most birds, who do not have layers of down feathers, will shiver to keep warm. Some will flock together on a branch in tight rows to share body warmth and shiver together. The real challenge is finding enough food, during the day, to give them the energy to shiver at night. Birds who frequent feeders have a better chance of survival. They can take the peanuts and sunflower seeds and use the protein in these nuts to fuel their shivering abilities. 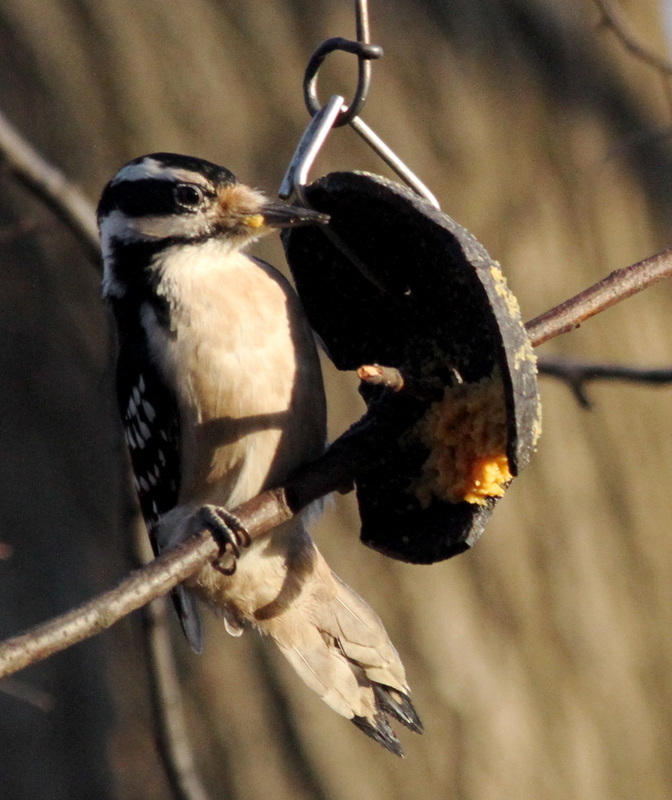 Wild birds, who cannot find feeders, use nature's own products to help them survive. At NYBG, crabapples, plant seeds, and sweet gum sticky ball seeds offer sustenance for our avian friends. The seeds and berries that were not picked off the branch now lay below the trees, buried in the shrubbery of winter's dormant foliage. Ground birds feast on these morsels gathering the precious food for survival. ​On yesterday's bird walk, we found a dead American Robin. The robin is an interesting bird. Once a migratory bird who signaled the beginning of spring in the northeast, the robin has been overwintering - for more than 15 years. And the number of overwintering robins continue to grow. They are a classic example of a evolution through adaptation. During the warmer months the American robin, or red breast robin will run along the ground, tilting its head trying to hone in on worm vibrations as they move through the dirt below. 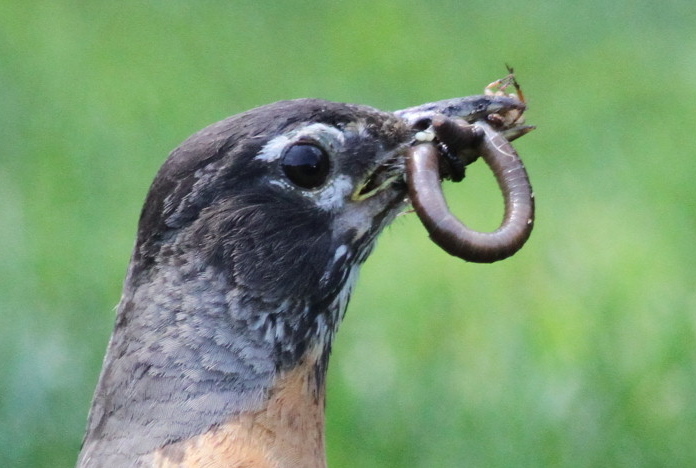 When the robin's toes feel the vibration of a worm it will jump and sharply drive its pointy beak into the ground to pull the worm from the warm earth. During the winter months, the worms are hibernating and not moving. The ground is frozen with ice and snow and not even a robin's beak can penetrate the winter frost. So robins have adapted to eating different types of food. Crabapples are a favorite, as the robins follow the example of resident winter birds who are feasting on the berries. We have observed robins turning over leaves in a marsh imitating rusty blackbirds who are also leaf turners. Is this learned behavior or a natural adaptation? The Eastern Towhee performs a dance in dry winter leaves thrusting itself back and forth to dislodge any hibernating spiders and insects from the leaves. Once an insect crawls out it is quickly gobbled up. White throated sparrows have adapted the Towhee's behavior in searching for food. Now you can watch a ballet of movement in shrubs on the grounds of NYBG as the white throated sparrow and towhee dance for their dinner. 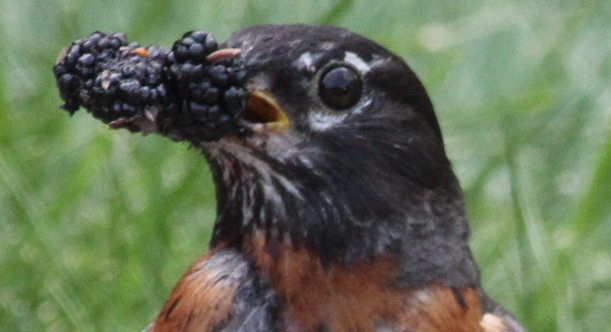 So who does the robin mimic when it comes to finding food? Most often we see robins with blackbirds, European Starlings, Cedar Waxwings, House Finch and American Goldfinch. Wherever we see these birds feeding in trees a poke of red breast robin with their distinctive call will peak out. When anyone doubts the theory of evolution, they need not look any further than the wintering American Robin. As for the dead robin we found, it could be that it was also evolution and the survival of the fittest that lay this robin to rest. Future generations will adapt in ways we have yet to observe to survive the northeast winter. Many people have been emailing me asking what types of birds they may see after the storm. Since this storm is coming from the west and up the coast - it might bring any southwestern birds into our area. Look for ducks and long earned owls who might get caught up in the powerful winds. As the storm turns off the Atlantic Coast it will bring sea birds closer to shore. The best time to see these rarities - if it is SAFE - is right after the storm ends. Sunday morning might be a good time to look off shore for seabirds and ducks who were drawn in by the wind gusts and high tide. 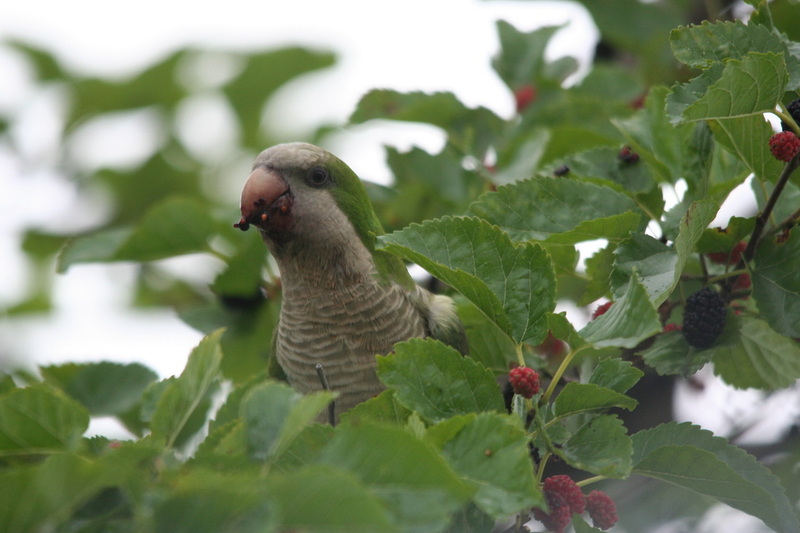 If you see anything good please email me: birdingaroundnyc@gmail.com or tweet @debbiebecker1. After the bird walk at NYBG I took a ride to Pelham Bay Park. 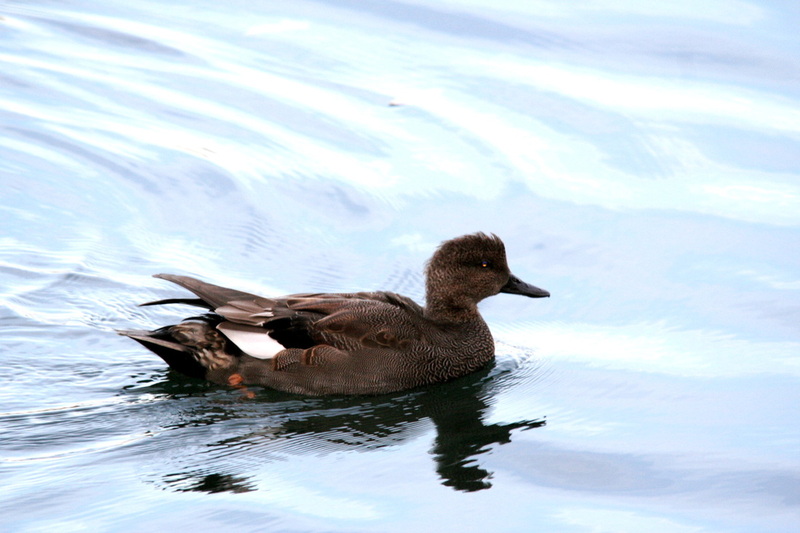 The unusually warm weather has impacted the duck population usually observed in the waters of the lagoon, Hunter Island and local beaches. I was able to find a few buffleheads, red breasted mergansers, hooded mergansers, gadwall, and even more surprisingly, 15 scaup! There were plenty of Canada geese, but nothing out of the ordinary. Except for the one red tailed hawk perched high on a snag it was pretty quiet. I stayed around till sunset to watch the deer gently emerge from the forest. They are so lovely to watch! The last Saturday morning bird walk of 2015 produced a surprising Nashville and black and white warbler. Another great day of birding on the Saturday morning bird walk at NYBG. We started out on the forest trail walking to Twin Lakes. Mallards were on the small lake and there was a bit of a birding frenzy at the larger lake. Thirty + red winged blackbirds were circling the lake along with a Pine Siskin and Rusty Blackbirds. Also observed was a brilliant mature yellow bellied sapsucker. The bird was beautiful with red and yellow highlights. An immature bird was also present as was a male purple finch. Another birder reported a flock of Pine Siskins earlier in the week. We followed the path back kicking up the juncos feeding by the Watson Building and found American Goldfinch, Fox, white throated, song and swamp sparrows, Chickadees and another mature sapsucker at the Swale. As we moved down toward the crab apples we spotted a BLACK AND WHITE WARBLER and a FLYCATCHER. The flycatcher appeared to be an Eastern Phoebe. Today's morning bird walk @NYBG had to be the best - since fall migration. Birds were everywhere and very active for a cloudy/rainy day. We started off by observing Rusty Blackbirds in the swale when I received a phone call from fellow birder Joanne Wasser who found one of our GHOs. We left the Rusty and headed straight for the forest finding the owl in a deciduous tree- quite visible. When comparing this male owl to the owl in Central Park you can certainly see differences in age and perhaps health. As nesting season approaches, we hope the NYBG owls have much better luck this year. At Twin Lakes we found a female Cooper's hawk being harassed by a mob of blue jays but the hawk held tight. We headed towards the Native Plant Garden spooking up Juncos as we walked. Earlier we had watched American Goldfinch on seed balls and scanned for the Pine Siskin, who might have been up there, but we were unable to get good looks in the dead light. In front of the Rock Garden we found 9 Cardinals -all juveniles - in a tree eating berries. It was a fantastic sight. (Photos on my website tomorrow). There was also a Hermit Thrush and Chickadees. And bird watcher Maya got her Yellow bellied sapsucker! We proceeded down to the Mitsubishi Path and encountered a pair of downy woodpeckers, white throated, song, swamp and fox sparrows. The white throated sparrows were singing sweetly. 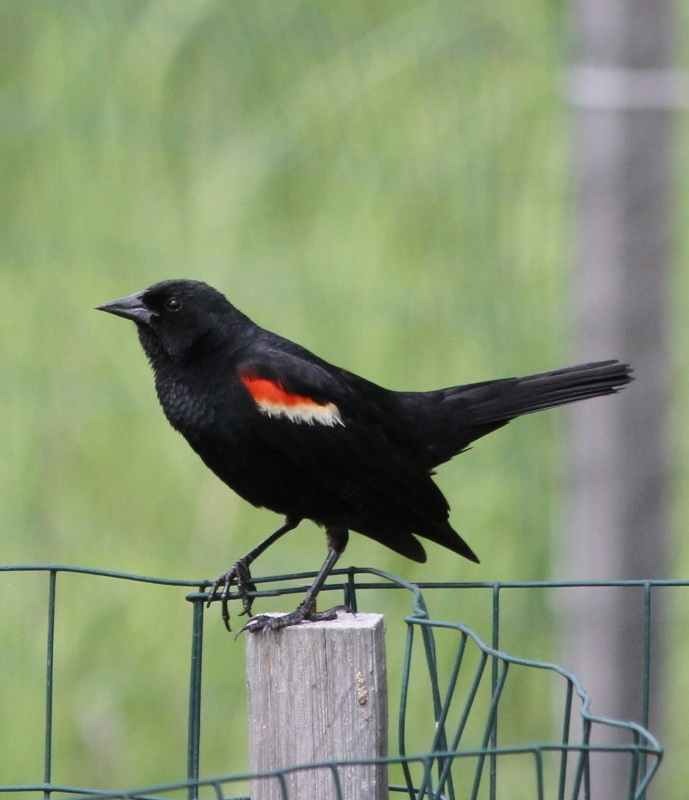 A red winged blackbird was sitting on the fence watching us watch all the commotion. There were birds everywhere! We wandered down to the crab apples where we found American Robins all over the red, orange and yellow berries. Another beautiful sight. Cedar waxwings, two Ruby Crowned Kinglets and a Purple Finch were trying to partake in the fruit while being buzzed by a Merlin and red tailed hawk. We spotted three more Rusty Blackbirds on the way back and a Cooper's hawk while scattering sparrows, cardinals and chickadees on the path. Beautiful day at the Saturday morning bird walk. Quiet winds and the last of the fall foliage made the day quite nice. 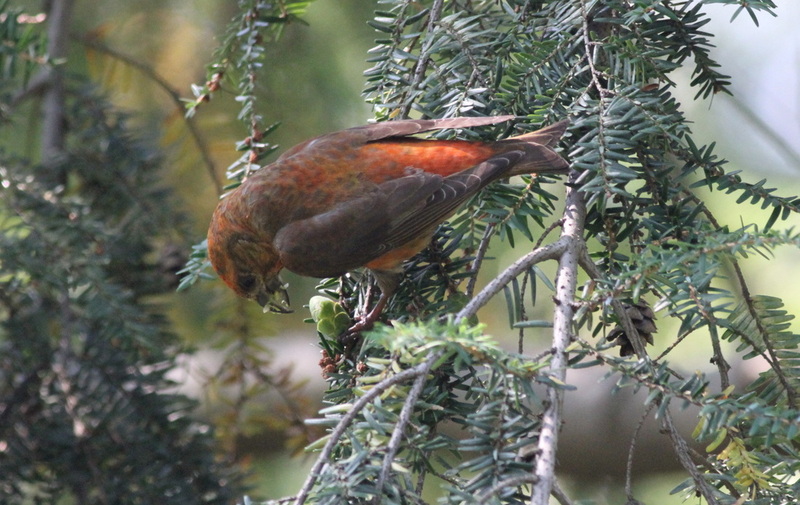 Highlights include Purple Finch, Pine Siskin, and Rusty Blackbird. Purple finch spotted in Native Plant Garden. Rusty Blackbirds in the marsh area. Pine Siskin in the Sweet Gum at the bottom of Azalea Way. Canada Geese separately fly over. perching with beak up on a branch. On the Saturday morning bird walk twenty seven birders enjoyed wonderful weather and the beauty of NYBG. The garden looks gorgeous as the late season blooms are giving summer its last looks. Spotted sandpipers, Eastern Kingbird, Canada Geese, Cormorants. The warblers are here! On a bird walk in Central Park we found, blue-winged warbler, photo above, black and white warbler, American Redstart and Northern Waterthrush. It won't be long now, before we start to see a steady stream of migrating warblers. Shore bird migration begins the third week in July! On the shoreline of Roosevelt Island, located off Manhattan, two spotted sandpipers were on the rocky shoreline. At Turtle Cove, in Pelham Bay Park, a Killdeer was hiding in the tall grasses. Since working on the Cove's water flow, ducks and marsh wrens were few and scarce this summer. Egrets and herons - although not in great numbers - are still on the Cove. 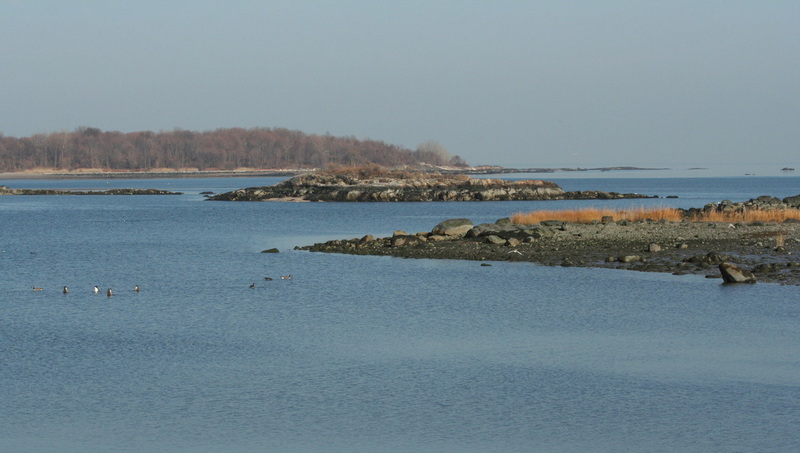 Jamaica Bay is also having their own water problems which will prove disastrous for shorebirds seeking low tides to land and feed. Birders reporting from Marine Park, in Brooklyn, have spotted Willets. Of course, Long Island is always a good place to spot shorebirds, terns and even a Lark Sparrow. 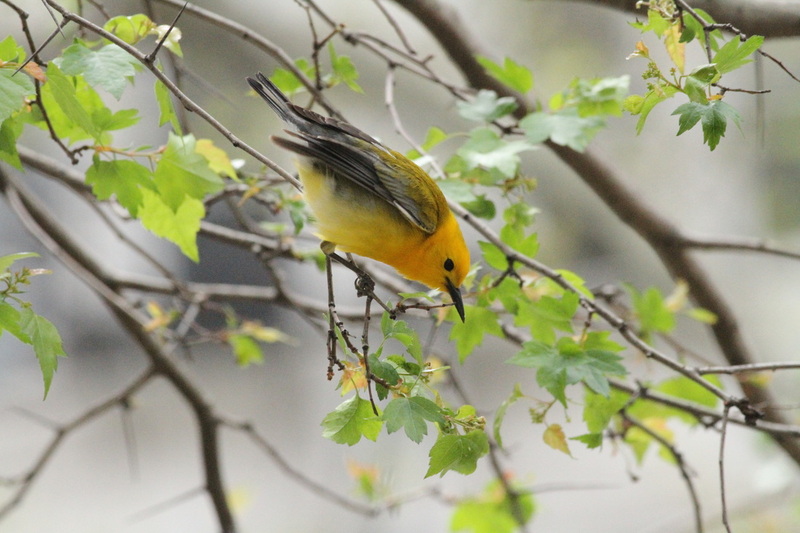 Central Park birding is beginning to pick up with a few warbler species here and there. Eastern Kingbirds are still at Turtle Pond along with night heron. 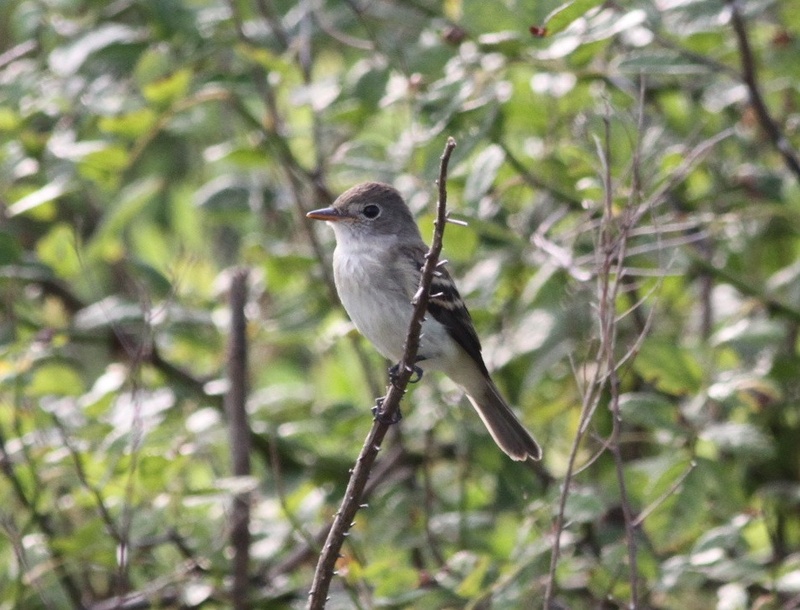 Flycatchers are scattered through the Ramble- listen for their call or watch for acrobatics from a tree limb. Late July is always a great time for butterfly watching. Shakespeare's Garden in Central Park is an excellent spot. An even better location is NYBG's demonstration garden located by the large cafeteria. My bird walks at NYBG will begin Sept. 5th and we will be looking for hummingbirds, monarchs, warblers and hawks! 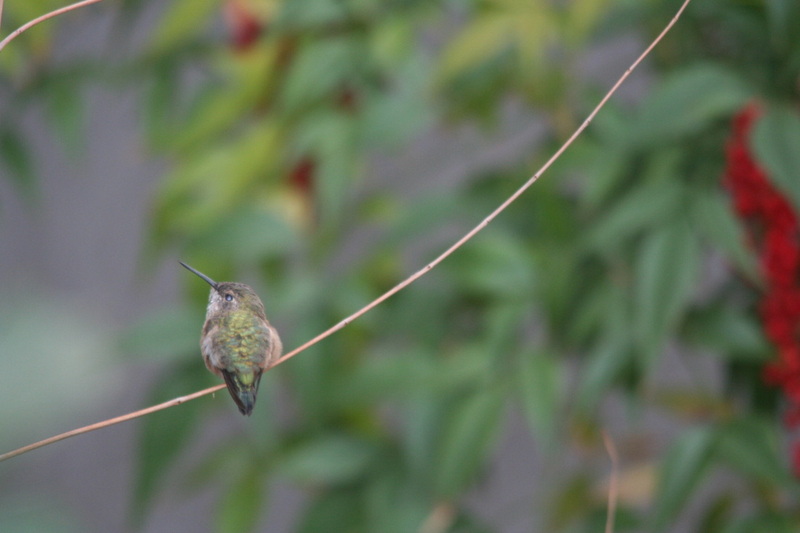 Highlights of the Saturday morning bird walk include a RUBY THROATED HUMMINGBIRD continuing in the Rock Garden. Also observed and heard: Cedar waxwings Chimney swifts Northern Flicker Baltimore oriole Eastern Kingbird Warbling Vireo Swamp Sparrow Chipping Sparrow Fox Sparrow Song Sparrow Red tailed hawk Osprey Tufted titmouse Chickadee White breasted nuthatch Catbird Cardinal Blue jay Mourning doves American goldfinch House wren Yellow warbler Red winged blackbirds Grackles Brown headed cowbirds Red bellied woodpecker Downy woodpecker American Robins American Crow My Saturday morning bird walk, at NYBG, will be on hiatus for July and August. The bird walk will return on September 5th at 11am. Many thanks to all the birders who join us on Saturdays to explore the Garden looking for birds. It is a pleasure to take a bird walk with each and every one of you! On today's bird walk we saw the most amazing sight! 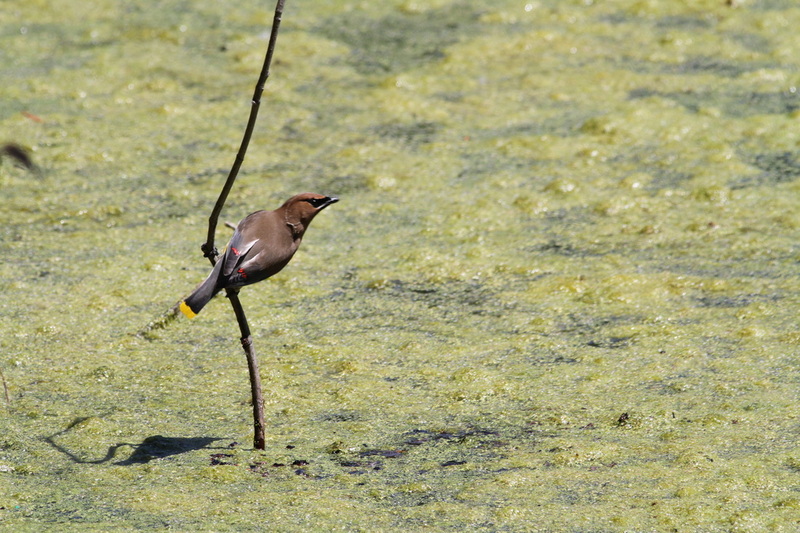 Two cedar waxwings performing a mating ritual. The male got lucky, and we got photos. See Spring Migration tab above. Nesting at NYBG - Baltimore Orioles, Eastern Kingbirds, Warbling Vireos, Yellow warblers, Mourning Doves, House Wren, Gray Catbirds, Cardinals, Blue Jays and American Robins. There may be Ravens or crows on the garden grounds too. Tree swallows and wood thrush are noticeably absent for the first time in many years. Another cloudy and rainy day for my Saturday morning bird walk at NYBG. We started out in the Native Plant Garden where we found yellow and Canada warblers. The oak tree which usually attracts many warblers was in full bloom and there were many birds high and in the density of the tree. We continued walking south through azalea way picking up warblers and listening to the sounds of the orioles echoing through the forest. At one point we watched a junior male oriole weaving his nest and pulling it tightly to the branch. In the forest we found a robin's egg, baby blue, laying quietly on the ground. We watched a chipping sparrow gather blossoms to line it's nest. And we found a yellow warbler and purple finch bathing in the stream. As the raindrops began to fall we heard the house wren, with its beautiful song, proclaiming its territory in the Children's Garden. The garden looks beautiful as the azaleas and peonies are beginning to bloom. After sitting at my desk all week watching Twitter light up every few seconds with warblers I finally got out to Central Park and got me a few! Here is what I missed! Blue wing, Hooded, Cape May, Bay breasted. But here is what I got in just four hours at the park: Mourning Warbler, Wilson's, Blackpoll, black and white, yellow rumped, Northern Parula, Nashville, Red eyed vireo, Scarlet Tanager, Balt. Oriole, Indigo Buntings -3, and Great Crested Flycatcher. Looking forward to leading the bird tour at NYBG 11 am tomorrow! On a chilly Saturday morning 26 people gathered for the weekly bird walk at NYBG. 4/10/15- Warblers are here! Palm, Pine and Yellow-rumped have been spotted throughout NYC parks. On tomorrow's bird walk at NYBG we will be looking for warblers. Tree swallows on Twin Lakes! These beautiful birds nest in the Children's Garden and often battle with House Wrens for the bird houses. Spring struggles, as winter holds on for dear life! Red-winged blackbirds, Phoebes, Pine Warblers and a Yellow-rumped Warbler were spotted in local parks this weekend. The past few weeks, including this weekend, have been brutally cold, snowy and icy. Many paths and trails at local parks have been covered with thick sheets of ice making most dangerous and not passable. At the NYBG we have been seeing our regular winter visitors including, fox sparrow, rusty blackbird and yellow bellied sapsucker. 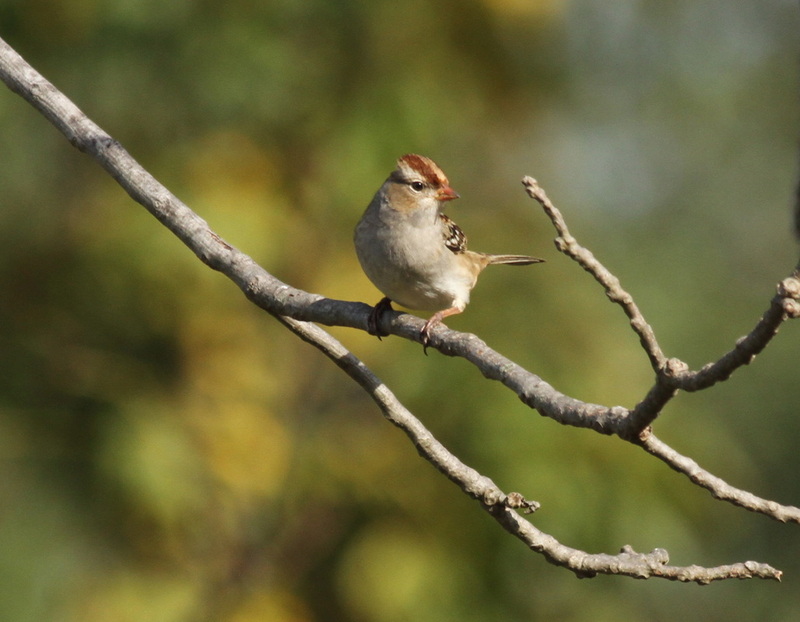 In Central Park, a Common Redpoll has been a regular at the feeders along with Chipping and Tree Sparrow. Along the Brooklyn inlets, a Thick-billed Murre has been spotted with additional Murres in the areas around Long Island. 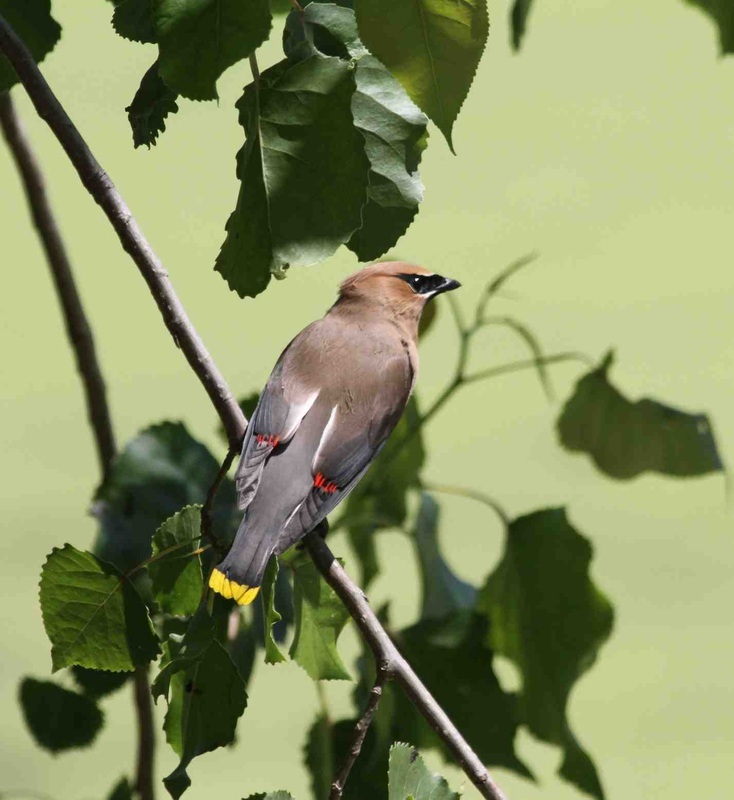 Also in Jones Beach a single Bohemian Waxwing has been spotted around West End 2. This area has been popular for Snow Buntings and Lapland Longspurs. More than 100 Bald Eagles have been spotted along the Hudson River, at least five down in the NYC area, with a pair nesting near a small island off the coast of Staten Island. This nest is record breaking. A gray phased Gyrfalcon has been dazzling birders and photographers in Ulster County, NY. Along the area of 14th Street - 23rd and the FDR Highway, Ruddy and Black ducks, Gadwalls, Brant, Bufflehead and a Red throated Loon were observed. During this cold winter it is always helpful to carry bread, crackers or even Cheerios to toss to house sparrows and other ground dwelling birds on the city streets or parks, where allowed. The ice and snow make it hard for them to find food, so a hand-out is always welcome. You can follow my bird count on my BLOG above. Just click! So while all the fuss in the West Village may seem strange to some it is a lot of fun for birders. Seeing a rare bird in NYC is amazing. And one of this magnitude that has never even been close to this part of the world simply amazing. The Couch's kingbird most likely was swept up the coast, from its home territory of Mexico and Guatemala, by a storm with high winds. Will he survive a NYC winter? We certainly hope so, but if the insects begin to disappear we certainly hope this holiday treat will take his cue and look for warmer areas to hawk his insects and delight others. 12/6/14- Rainy Day at the bird walk. While searching for owls the heavens opened up and poured upon us. Undaunted we pressed on, but could not find any owls. 11/8/14- 43 birders joined us today. Garden and we were not disappointed! 10/4 Rained Out! NYBG - Heavy Rain prevented birders from attending the bird walk on 10/4 at NYBG. Tomorrow's forecast doesn't look too promising either, but there will be a walk. If anyone is unsure about the walks, please email me at BirdingAroundNYC@gmail.com before 10am. I birded ALL of Central Park. Well, most I should say. I started at 102nd Street and walked around the compost heap, chip pile, Sparrow Rock, Great Lawn and then down to 86th and the Pinetum ultimately winding up in the Ramble. I did manage to see a Pine Siskin, Magnolia, Yellow rumped and Common YellowThroat. Not much of a haul for an all day adventure. The sparrows should be arriving in the next few days and this is a chance to see birds that only pass through once a year. While uncommon warblers seem to be quite common, the common warblers are nowhere to be found. Ovenbird, Common Yellowthroat, Hermit thrush. First walk of the season at NYBG and it was a very warm outing. 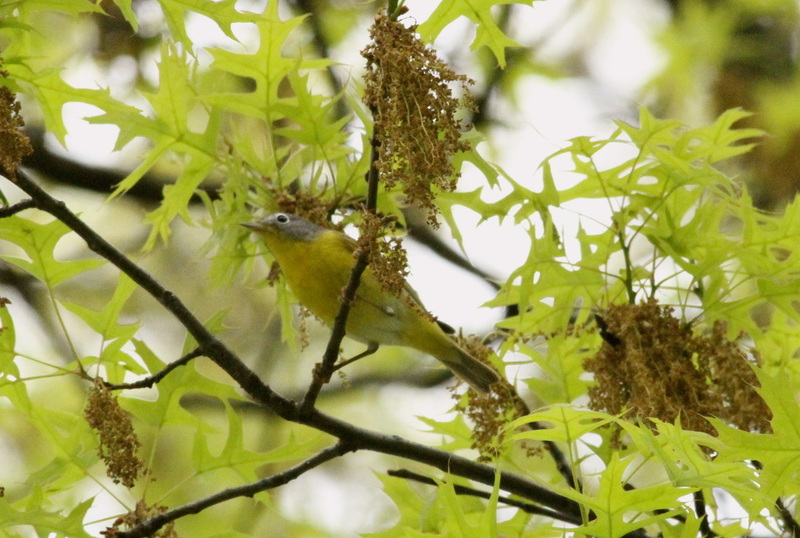 Highlights include NASHVILLE and ORANGE CROWNED warblers. We went at low tide and did not see any shorebirds. Quite different than last year, about this time. The last bird walk of the season was quite rewarding. Highlights include Great Horned Owls, Cedar Waxwings, and Warbling Vireo. We started out in the new Native Plant Garden and were amazed by the meadow. Dragonflies and damsels were darting about all the native flowering plants. This is the haven that produced a Lark, Clay, and Vesper sparrow, last October. We are excited to see what this fall will bring as the new plantings will be even more mature with seed. The tour continued around the swamp, where we saw Cedar Waxwings. Then up through the Crabapples watching Orioles bathing and Eastern Kingbirds fly-catching. We went down to the secret forest, along the Bronx River and observed a Cormorant swimming, under water, like a shark. We passed the waterfall and went into the forest looking for our resident Great Horned Owls. We found two- see below. It was a wonderful 3 hour journey with very nice birders some who were new and many of the regulars. Along the way we spotted: Eastern Kingbirds (2 Baltimore Orioles-( 5 Warbling Vireos- (6 Cedar Waxwings -6 Blue jays-4 Cardinals -3 Red winged blackbirds-4 Cormorant -1 Osprey-1 Turkey Vulture-1 Mallard-2 Yellow warbler - heard Northern flicker- 2 Red bellied woodpecker -3 heard White breasted nuthatch-1 Mourning dove-4 Song sparrow-3 Chipping sparrow-2 heard American Robin- many Grackle-13 The best part of the tour occurred when we were looking for the resident owls. With all the foliage they blended in nicely, but at one point we heard jays mobbing and suddenly a large bird flew out from a branch - it was an adult GHO! It flew right by us- jays in hot pursuit! After carefully examining the surrounding trees, I found the cat like eyes of the immature GHO staring at us through a break in the foliage. This owl has the largest eyes I have ever seen on an immature bird. (I will post photographs on my site later). We had great looks and then left quickly so as not to disturb the owls. The tour ended by the small pond in back of Twin Lakes as we watched 3 Orioles searching for food in the trees. As this season comes to an end I would like to thank all the birders who come to my Saturday morning bird walk; rain, shine, snow, sleet and even tropical storm! This year we had so much snow that many of the paths were covered but somehow we managed to get all the good birds in the garden. It's been a pleasure to meet all the new people who are learning how to bird watch. it is also a great deal of fun to bird with the "regulars." Thank you! I hope to see everyone September 6th at 11am when the walk resumes. The great fall migration begins in September - so don't miss the Hummers, hawks, warblers and eagles! Until then, have a great summer and happy birding! The Saturday morning bird walk at NYBG observed/heard the following birds. Our immature great horned owl was observed and appeared to be healthy and quite alert. Highlights of my Saturday morning bird walk include another wonderful day of warblers - near the Children's Garden- and PURPLE FINCH. Wet, sticky, foggy and plain yucky but I was determined to see a Hooded and Wilson's warbler today. It took me almost 3 hours to get to Central Park with Friday traffic, but it was well worth the journey. I didn't get the hooded, but had 2 Wilson's who were flying around like crazy birds, Black throated green, Canada, Least flycatcher, American Redstart, Ovenbird, Veery, and the usual suspects. Spectacular day of birding highlighted by a SCARLET TANAGER taking a bath, BLACK THROATED GREEN, CHESTNUT SIDED and INDIGO BUNTING. A ROSE BREASTED GROSBEAK landed right in front of us with an insect in its beak. For the most part, the birds were eye level making it a wonderful bird walk for the 44 birders. Warblers, warblers, warblers! It is May 1st and it is time for warblers! Join me on a bird walk at NYBG to look for warblers and all spring migrants beginning this Saturday, May 3rd- June 28th. As for birds we had 1 Yellow rumped warbler and heard a blue gray gnatcatcher. Highlights from my Saturday morning bird walk at NYBG include a very visible American Woodcock, Eastern Phoebe, Rusty Blackbirds, Pied billed grebe on Twin Lakes and 4 Turkey Vultures. Highlights from my Saturday morning bird walk, at NYBG, include a growing flock of 18 + RUSTY BLACKBIRDS in the wetlands area behind the Children's Garden; 8-RED WINGED BLACKBIRDS and 2 GOLDEN CROWNED KINGLETS. Cardinal - 3 males, in different locations, all singing! Highlights from today's bird walk include 12 RUSTY BLACKBIRDS, 3 RED WINGED BLACKBIRDS, 2 YELLOW BELLIED SAPSUCKERS and 1 RED BREASTED NUTHATCH. After reading Pat Pollack's post (re: Reservoir) we set out to find the Ring-Necked Duck, Northern Pintail and Common Merganser she found. Good luck brought us the Ring-Necked Duck with spectacular views on the west side of the Reservoir. We picked up Buffleheads, Coots, Black Ducks, Pied-billed Grebes, Ruddy Ducks, Hooded Mergansers, Mallards and Canada Geese. We decided to try the Pool where we found Wood Ducks, Buffleheads and a large flock of Grackles bathing. Heading back to the Reservoir we finally found the Northern Pintail and C. Merganser - at the NW and NE corner. We also found Pat Pollack -guiding birders to her wonderful finds. 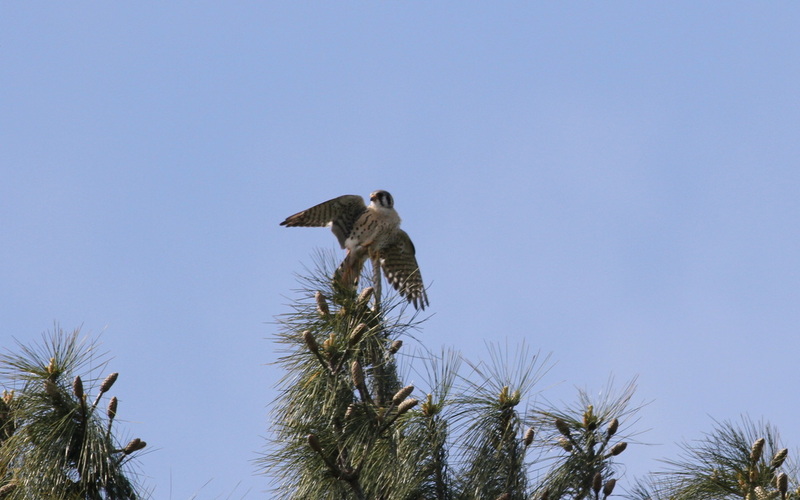 Also observed- 2 American Kestrels at the Pinetum. Good Birding, Debbie Becker, Zach, Joanne, Steve, Ettie, Gunda, Linda, Todd, Joan, Sandy, Ruth and Ira. There's a new Owl in town! Mrs. Robusto, the female owl- left widowed last year- may have a courter as a new owl has apppeared in the forest of NYBG. 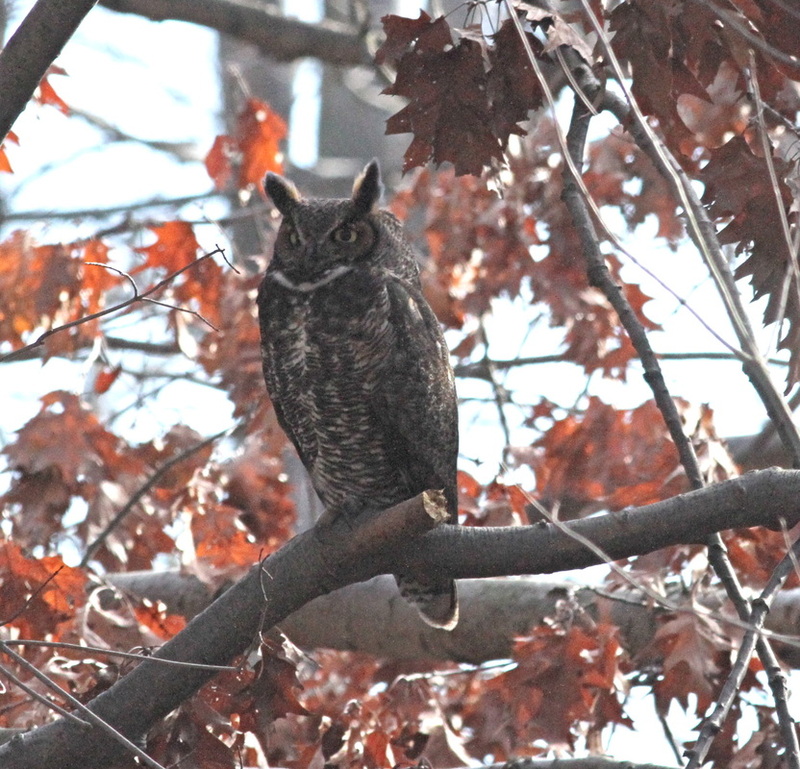 Spotted, last Saturday, on the bird walk, this rather large Great Horned Owl was hiding in a tree, well out of view. Mating season for our resident Great Horns begins at the end of December and this new fellow may have shown up just in the nick of time! 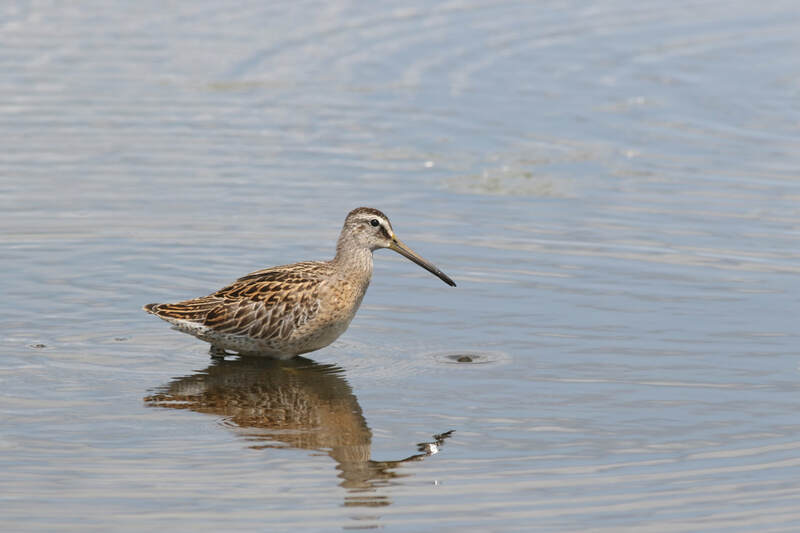 A Wilson's Snipe was observed, at the Oven, in Central Park yesterday. Very birdy day at NYBG! Lots of sparrows but none of them were target birds. Song sparrows were more than abundant with 50+ spotted throughout the garden. One field sparrow at Twin Lakes along with 4 RUSTY BLACKBIRDS and a BROWN CREEPER were the highlights of the day. A tour around parts of Randall's Island, searching for sparrows, proved a bit disappointing. At the salt marsh area a single quick sparrow darted into the brush never to resurface again. Yellow rumped warblers were abundant on the north side of the marsh. Several mallards were on shore. The tide was out and could have attributed to the lack of sparrow activity in the marsh. Walking to the south side of the island near fields 80-60 we were treated to a large mixed flock of warblers; pine, palm, and yellow rumped foraging with chipping sparrows. Also mockingbird, hairy and downy woodpecker were spotted in the wooded area. Other than 1great cormorant and several immature double crested cormorant we did not spot any other water fowl. It's a beautiful island accessible by foot bridge from 103rd St and FDR Drive in Manhattan. 10/15/13 - Sora - Bryant Park! A small rail- like bird, Sora remains in Bryant Park darting through the bushes in the beds adjacent to the lawn area. Why this marsh bird has chosen to set down in Bryant Park remains a mystery but to the birder who spotted the Sora, thank you for the life bird! 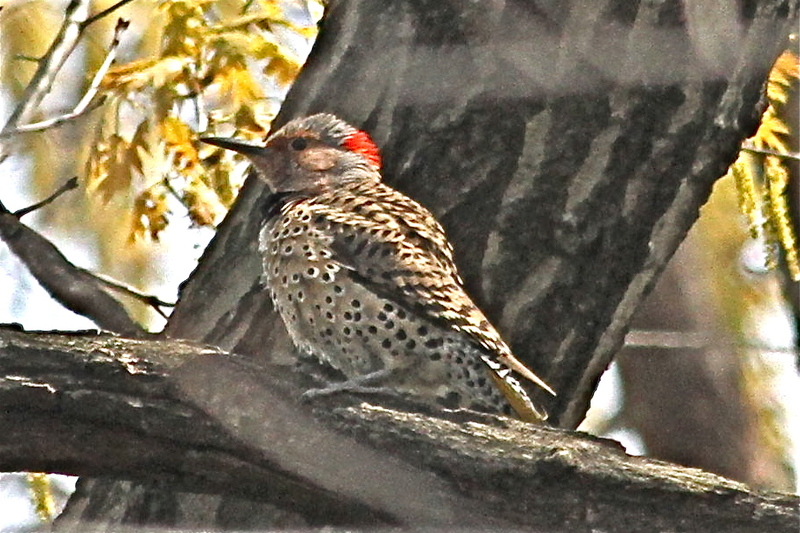 I attempted to find Jack Rothman's Red headed woodpeckers at Pelham Bay Park. I had tried on Saturday without much success - but did have a palm, prarie, savannah, many song, swamp, clapper rail and belted kingfishers as consolation birds. Today, I followed the directions given to me by Jack and while on the trail received a call from Joe Morales (he had observed the woodpecker earlier) who guided me closer to the bird but I still could not locate it. I eventually gave up and returned to Turtle Cove -which was way less birdy than it had been on Saturday. While on the path I heard footsteps and ran into Steve and Joanne who were also looking for the RHW. We decided to look together and tried following the driving range path Joe advised. When we came to the clearing with two paths we took the lower path that Jack's directions called for - but actually traveled further down the path when we saw the unmistakable white, black and red colors fly past us. We spotted 3 adult RHWs!! They were flying back and forth over the path giving us outstanding views! It was quite a sight! Thank you Jack Rothman and Joe Morales!! •••Thank you to the people who responded to my email about the "stunned" bird. 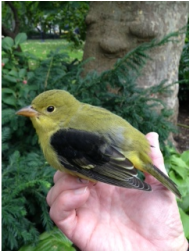 The Scarlet Tanager was revived and released. Picture below. They say if you build it, they will come. NYBG created a Native Plant Garden, last May, and on today's bird walk we spotted a LARK SPARROW in the new garden! Martin Carney - you were right! Also at the Native Plant Garden; Chestnut sided and Common Yellowthroat. The bird watchers called the tree "magic" and so it was! There were Ruby throated hummingbirds (8) on every patch of Jewel Weed. I decided to see how the local parks were doing in terms of migration. Wednesday, certainly turned out to be flycatcher day. Birding midtown to lower Manhattan 8:00am- 1pm. 8/27/13 - I had the pleasure of participating with Jack Rothman on a walk he organized with three birding clubs. Click on the link for photographs and bird list. It was a great walk! Thanks Jack! While searching for shore birds at Turtle Cove in Pelham Bay Park and coming up with absolutely nothing - I decided totry Bartow Pell Mansion for early migrants. Blue - gray Gnatcatchers were everywhere. They often nest in the area. I counted at least 8! A Baltimore Oriole was preening in the sunlight; Ruby throated hummingbird was sipping from a Cardinal flower; American Goldfinch gently plucking seeds from a giant sunflower whose head was bowingwith weight. 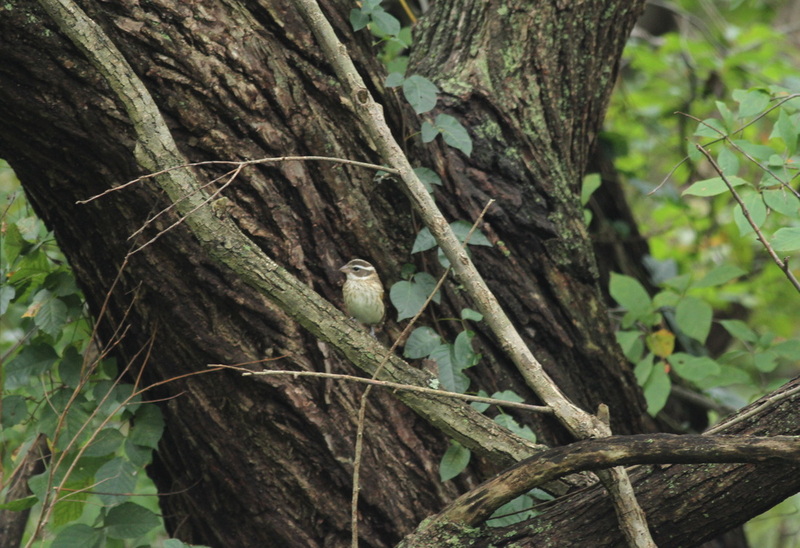 A Carolina Wren was vibrantly calling and displaying from a wood pile- while it's young foraged the vegetable garden. A Raven thundered over the woods with its mighty call and darkening fly over. A Great crested flycatcher flew by and landed on a gnarly tree. A Silver spotted skipper and Question Mark bathed in the sun. Not a Monarch in sight - yet. On City Island - Forster Terns and 5 Osprey all diving andcatching bunker! A single Sanderling - its flock flew further down the shore. Great and Snowy egrets. Glorious day! We birded Central Park from 2:30-6pm covering the area around and including the Ramble. A possible Yellow billed Cuckoo in the Maintenance Meadow along with a Ruby throated hummingbird being chased by an Eastern Kingbird over Turtle Pond, highlighted our day. Baltimore Oriole-1 Eastern kingbird-6 Eastern wood peewee (heard) Marsh wren- Turtle Pond Wood duck-1 Mallard with 4 ducklings Red tailed hawk-2 Chimney swifts-many Barn swallow-2 Cedar Waxwing-1 immature Hairy woodpecker -1 Red bellied woodpecker -1 BC Night Heron-1 Catbird, House finch, Cardinal, Blue Jay, Mourning Dove, Grackles, American Goldfinch. With Debbie Becker, Zach, Joanne, Steve, Todd, Joan, Ettie, Camille, Maisy, Cheryl, Ruth, Ira and Norma. After reading Jack Rothman's post on Turtle Cove I decided to drive over and take a look. Unfortunately, the weather was hotter than hot and the birds appeared to be cooling somewhere in the shade. I did get to see two Warbling Vreos feeding their young, a Great Crested Flycatcher, Tree Swallows, Osprey in their nest, Chipping Sparrow, Cedar Waxwings, Great Egrets, Snowy Egrets, Killdeer and Willow Flycatcher (heard). Yesterday's bird walk at Central Park - although wet - was very productive for a rainy mid- July day. Highlights include: Olive sided flycatcher calling from a tree top in the Upper Lobe. Immature Cedar waxwings, Warbling Vireo and (3) immature Eastern Kingbirds (very quietly sitting on a top branch as their mom went back and forth bringing them tasty morsels) by Bow Bridge. Barn swallows, Black crowned Night Heron and Chimney Swifts at Turtle Pond. Willow flycatcher and a Black crowned night heron (in breeding plumage) at the Oven. The usual suspects include; Grackles, Blue jay, Cardinal, Catbird Mallard, Canada goose, American Robin (many still on nests and lots of immature speckled birds), Hairy woodpecker, Red bellied woodpecker, Northern flicker, and Tufted titmouse (heard). Checked ponds and lake for skimmers - but came up empty. Last bird walk for the 2012-2013 Season. Bird walks resume September 7, 2013. Thank you to all the wonderful birders who join me, every Saturday, in the rain, snow, sleet or sunshine, to walk the beautiful trails at NYBG, looking for birds. It has been a pleasure to guide you through the Garden. I will begin my 29th year of leading walks for NYBG September 7th. I hope you will be there to join me. Cardinals were calling, Red winged black birds were flashing their red epaulets in territorial defense, immature grackles were chasing their parents begging for food and warbling vireos were working the treetops gathering insects for their young. It was a very busy birding day! PURPLE MARTINS! A pair were hunting on Turtle Cove at sunset. A very unusual sighing. I have spotted Purple Martins on Long Island, but never in the New York City vicinity. I also observed nesting Oriole, Osprey and Yellow Warbler along with Marsh Wrens, Red winged black birds, Black Crowned Night Heron and Great Egret. The Marsh Wrens are back! Those noisy little birds who speckle the reeds over by Turtle Cove are singing their song and jumping up and down. 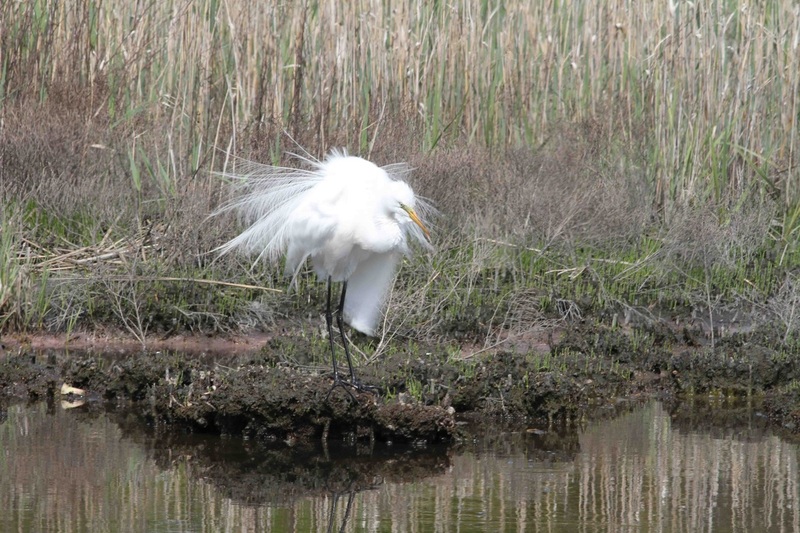 Great Egrets were also spotted, along with a Baltimore Oriole. Friday's rain storm turned the Bronx River into an amazing sight as it rushed through NYBG. The rain filled the forest with babbling brooks and turned the waterfall into a spectacular rush of water. Even though a small iron fence separates you from the waterfall the motion of the water, spray and sound were breathtaking. Anyone who wants to see nature in action should go to NYBG today or Tuesday before the fury subsides. Highlights from my Saturday morning bird walk: we saw a Catbird chasing a chipmunk in a crabapple tree; Cedar waxwings were everywhere; a Bald Eagle soared over the Bronx River while an Eastern Peewee continuously called from a branch above the water. There appears to be an absence of Eastern Kingbirds at NYBG and an increase of Warbling Vireos. Usually Eastern Kingbirds nest in the Sycamore trees along the Bronx River. Yesterday, we spotted four Warbling Vireo nests in the Sycamores but not one Eastern Kingbird. 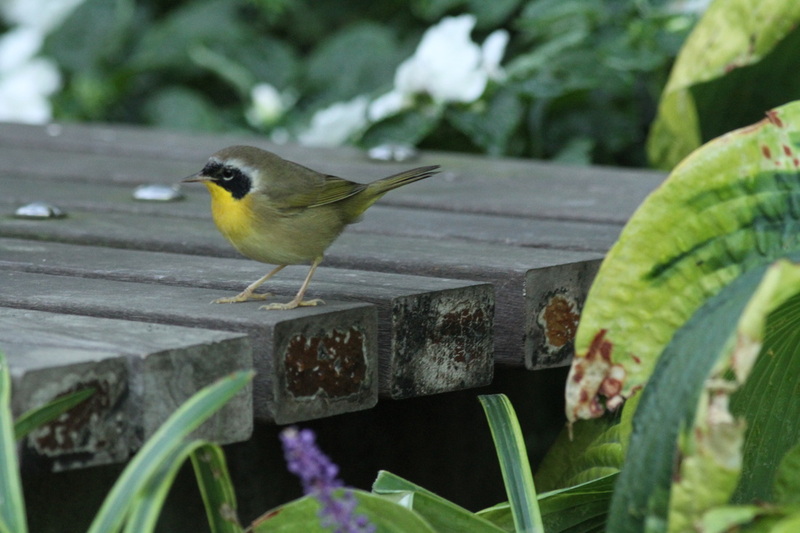 The warblers were with us at NYBG - always the best place to bird. 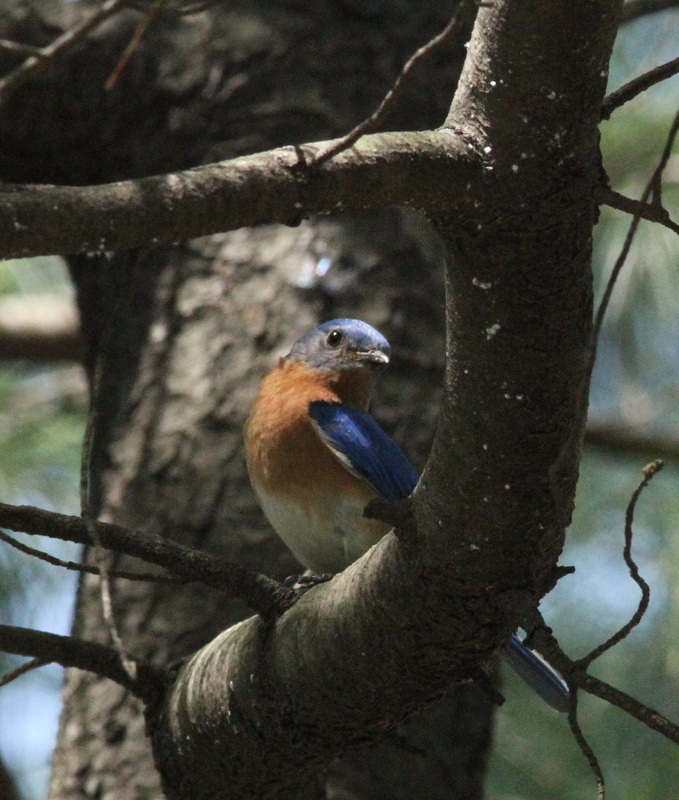 The diverse habitat makes NYBG the perfect place to increase your birding numbers and see really good birds. The following birds were spotted on my Saturday morning and afternoon bird walk. Northeast winds persist and the warblers were few and far between. I had two bird walks today, to celebrate the opening of the Native Plant Garden. After birding NYBG for 6 hours we saw the following birds: WORM EATING WARBLER PRAIRIE WARBLER Yellow warbler Palm warbler Yellow rumped warbler Black and white warbler Great blue heron Cormorant Wood duck Mallard Eastern Phoebe Northern Cardinal Blue Jay White throated sparrow Song sparrow Chipping sparrow House sparrow American Goldfinch Downy woodpecker Red bellied woodpecker Northern Flicker Red winged blackbird Cowbird Chimney Swifts Rough winged swallow Grackles Tufted titmouse White breasted nuthatch Red tailed hawk Snapping turtle Red eared sliders Beavers are making progress taking down a large tree on Bronx River. "People" on my bird walks. Imagine my surprise walking down 6th Avenue in New York City and spotting a Scarlet Tanager sprawled out on the sidewalk- an apparent victim of a window collision. Its eyes were closed and it looked dead. People were brushing by the bird as I dove on it like a fumbled football at the Giants' game! I have found migrating birds before, some dead, some still alive. I quickly retrieved the bird and began massaging its body looking for a sign of life when its eye opened just a bit, giving me the hope I was searching for. I held it cupped in my hands to keep it warm and began looking for a place to keep it safe as I was expected in school. A nearby park looked quite promising. By the time I walked to the park–the bird was almost, fully recovered. I brought it over to a shrubby area where the leaves were olive green. I held out my hand and with a burst of energy the tanager flew to a nearby branch, blending in quite nicely. I ran late to where I was headed, but my encounter with the Scarlet Tanager was quite worth it! 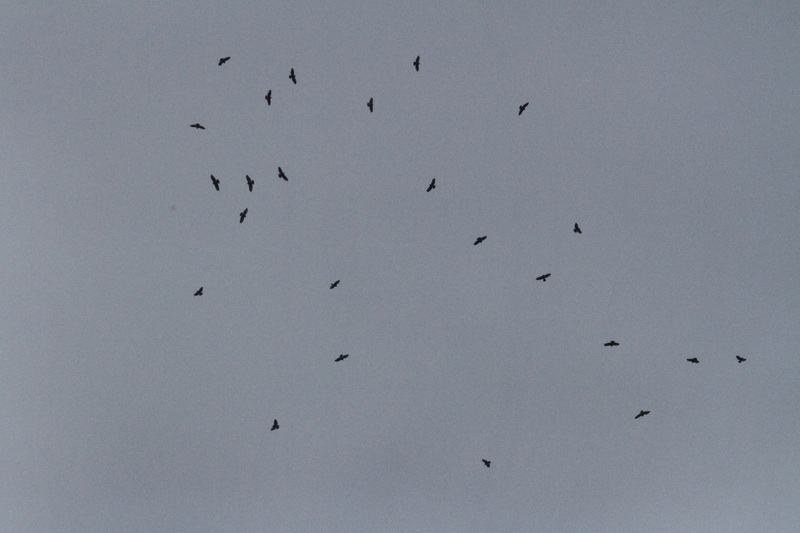 Broad winged hawks forming kettle - NYBG 9/14/13 Northwest winds. Perfect migration push! NEW PHOTO ESSAY ON NYBG WILDLIFE BLOG! 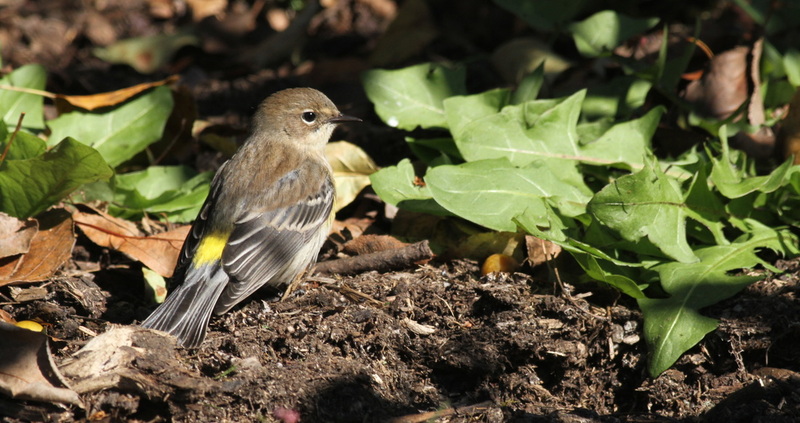 This photograph of a Yellow rumped warbler is featured on a information stand in the Native Plant Garden at The New York Botanical Garden.